Codementor Support - How do I start a session with a mentee? All Categories ​>​ I&apos;m a Mentor ​>​ Start a Session with a Client ​>​ How do I start a session with a mentee? How do I start a session with a mentee? 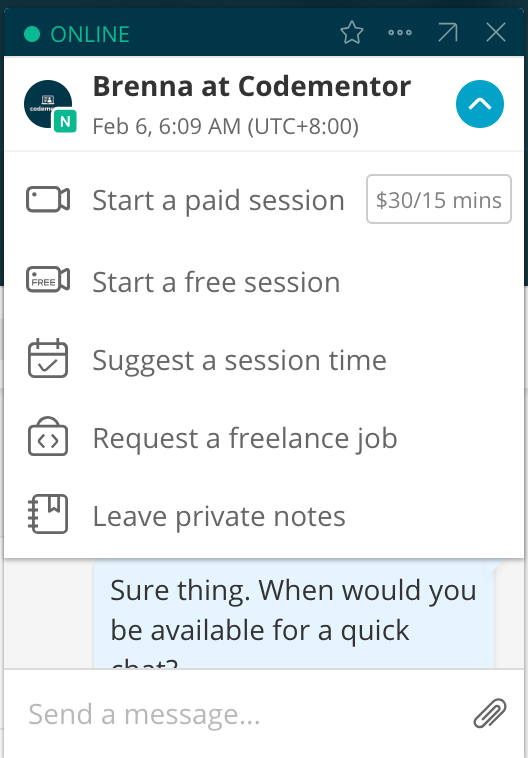 You can request to start a PAID or FREE session with a mentee via the chat window, as shown in the image below. The mentee will be sent a unique link to enter the session room - this is for the mentee to click on only. Once the mentee has entered the session room, you'll be notified to join the room. Free sessions are meant for exploration for both you and the mentee. Need more information about the request? This would be a good chance to get clarifications on them. Once you are certain what this request is about and that you can be of help, you then start a paid session or a freelance job, depending on your mutual agreement. When you enter the session room for a paid session, you and the mentee will automatically begin a preview period which should be used to set up communication tools and briefly discuss the issue before starting the paid session. Please note that the session timer doesn't start until you or the mentee click on "Start a paid session." How do I start a session with a mentor? How do I schedule a session with a mentor? How do I schedule a session with a user?